As the skin sheds slowly, the mount becomes more stable. And I would climb to redefine the path if I were able. Ben Hardesty doesn’t look the part of a rock star as he navigates a rickety tractor through the sprawling ranch where he grew up and fell in love with music. On the edge of The Great Dismal Swamp, Hardesty developed his spirit of adventure, and passion for doing things a bit differently. His father, Dan gave him a guitar when he was two, and later told him, “It doesn’t matter if you play it right, just make it sound good!” Not the typical teaching method, but then again, The Last Bison is anything but typical. Already the band has drawn flattering though imperfect comparisons to indie rock superstars the likes of Mumford & Sons, The Decemberists and Fleet Foxes. Flattering because each of those bands has carried folk rock into the mainstream; imperfect because none of them have a front man that shares the stage with his father and sister, nor uses a 75-year-old chaplain’s pump organ and Bolivian goat toenails on stage. The Last Bison is a tight knit community of family and friends that boasts a sound all its own. Ben appears every bit the man to lead such an outfit. His husky frame and thick facial hair match his gravelly yet soulful voice. He drives a 1989 wood-paneled station wagon – the muffler fell off during an off-road escapade – and he brews mead in his family’s kitchen. He’s joined by a cast of family and close friends – drawing authenticity from many nights spent jamming around backyard bonfires, spontaneously creating music in the living room, and leading songs with the extended community at their local church. The Last Bison’s live shows transport audiences from urban music halls to another, less familiar, era. Rich melodies accent unabashedly spiritual lyrics. Traditional folk instruments resonate with unexpected arrangements –sharing the musical space with lush family harmonies, classical strings, and earthy percussion. Band members appear to have stepped out of an 18th century stagecoach. The look hints at the band’s roots in colonial Virginia, while the sound transcends a defining era. 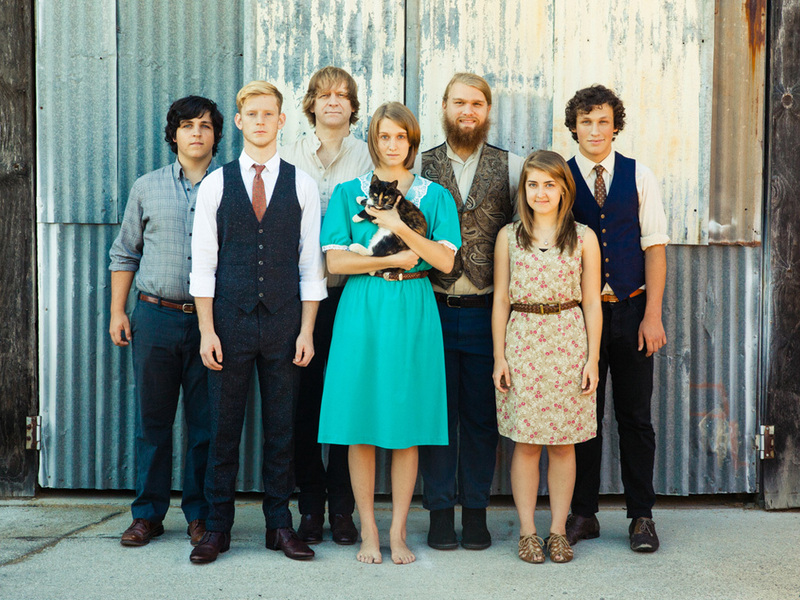 Six of the band’s seven members are the products of homeschooling, including Ben and his younger sister, Annah, who plays bells and sings backup vocals. A couple of longtime friends – percussionist Jay Benfante and his older brother, Andrew, who rocks that antique organ – grew up going to church with the Hardesty’s and were a natural fit. The band received a refining touch with the discovery of two classically trained strings players from a local home-schooling cooperative. Add Teresa Totheroh on violin and Amos Housworth on cello, and the band’s richly layered sound is complete. The Last Bison released their major label debut “Inheritance” EP on October 23rd through Republic Records.